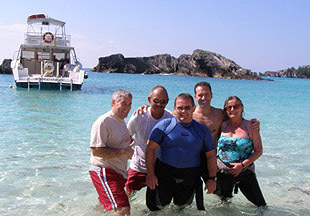 The Adventure Kids go scuba diving in Bermuda with DIVE Bermuda and felt like we were diving in an exotic aquarium with its rich and diverse sea life and many shipwrecks. 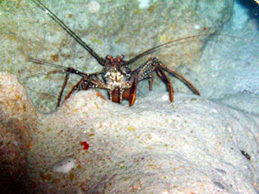 Bermuda is teeming with sea life and with 53 shipwrecks, and offers divers the ultimate in a diving paradise. 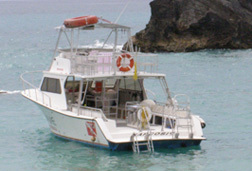 We flew to Bermuda in October 2007, and were exhilarated with what we found while diving with DIVE Bermuda, a PADI Five-Star facility. For starters, Bermuda, located in the North Atlantic Ocean, 1045 km (650 miles) east of Cape Hatteras, North Carolina, and 1529 km (950) miles north of Nassau, Bahamas, is less than 2 hours flying time from New York making it an easy getaway for a long weekend or for a full-fledged holiday. 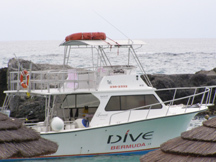 If proximity to the United States was not enough to whet our diving appetites, as a further enhancement, we learned that many of the Bermuda dive sites are approximately a ten-minute boat trip from shore. Armed with multiple compelling reasons, as Divemasters, we were eager to explore the undersea beauty of Bermuda. On a sunny, blue-sky morning we waded out to the DIVE Bermuda boat, Narcosis, located at The Fairmont Southampton, climbed onboard, and with the Dive Bermuda team of Captain Heinz, Mark, and Derek, and fellow divers Ken, and Susie, we headed off ready to begin our exploration of underwater Bermuda. With the sun on our faces and a light breeze blowing through our hair, we sighed and thought it does not get much better than this. With many wrecks to select from as dive sites, Mark, who was leading up the dive, asked our group if we wanted to dive a historical wreck or an artificial reek, and it was unanimous in our decision to dive a historical wreck. 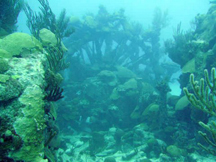 Within minutes we arrived at our first dive destination, the wreck of the Marie Celeste, a blockade-runner during the American Civil War with Bermudian pilot, Mr. John Virgin, at the helm that struck a reef and sank within a matter of minutes on September 26, 1864. Although the crew was rescued, there were two casualties, the cook who returned to the ship in search of his cat. After a dive briefing from Mark, we donned our equipment, took a giant stride off the boat, and made our descent into the clear, warm waters with a promised "viz" (diver's slang for visibility) between 18 - 24 meters (60 - 80 feet). We made our approach over the white sand rippled bottom and were exhilarated when we first laid our eyes on the well-preserved Marie Celeste, a 68-meter (225 foot) paddlewheel streamer that rests in a large sand hole at a depth of 17 meters (55 feet), and has one of its paddle wheels standing in an upright position and its other wheel resting on its side on the sand. Crusted over with coral, the standing paddle wheel was clearly visible as were the boilers where large chunks of coal rested nearby on the sand. We penetrated the shipwreck to have a closer look at the bow and the stern, as well as artifacts, many of which have been tagged to provide divers with information on the artifacts, feeling a strong connection with the history of the Marie Celeste and Bermuda. The sea life around the shipwreck was extraordinary and we lost track of the countless numbers of fish we spotted including Spotlight Parrotfish, which playfully darted in and out of the holes of the shipwreck. Throughout the dive we spotted bright blue Parrotfish, colorful Spotlight Parrotfish and found several remnants of discarded parrotfish "sleeping bags" (parrotfish produce a protective substance that covers them while sleeping, which they discard when they awake) resting on the sandy bottom. 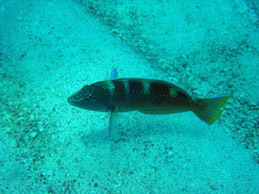 Other fish sightings including pretty Bluehead Wrasse, Yellowtail Snapper, Tangs, Sergeant Major, Bluestriped Grunt, and Yellow Goatfish hovering along the bottom using their yellow chin barbels searching for food. Exploring a reef wall we spotted a Nassau Grouper that looked like a prehistoric being, who apparently, felt safe enough in our presence and allowed us to come up next to it and enjoy a closer look. Then again, who was really looking at whom? We swam through tunnels, and caverns before reaching our pre-planned bottom time, we made a safety stop over an exotic reef covered with Brain Coral, Fire Coral, brightly colored Anemones and Sponges, Double-forked Plexaurella, and purple Sea Fans that beckoned in the undulating water like aquatic ballerinas. We slowly made our ascent to the surface with our minds swimming with wonderful memories of all we had just seen. We climbed up the boat's ladder, swapped out our used air tanks for fresh tanks, and rested while Captain Heinz drove us to our second dive destination. Our second dive was a shallower dive, and we took a quick look at another shipwreck, an unidentified English sailing ship sunk in the 1700s, that was found in 1983 and is called "Kevin's Wreck" named after Kevin Burke, the man who found it. The wreck rests at less than 50 feet, and after a brief look at the shipwreck we continued our exploration of another coral reef. The coral reef at this site had many swim throughs, tunnels, and caves that we explored before popping up on top of the reef to have a look at the diverse group of juvenile fish, and the adult fish populated throughout the reef. A few of many fish sightings on this dive included Tangs, Triggerfish, and a large Black Grouper that also allowed us close contact. 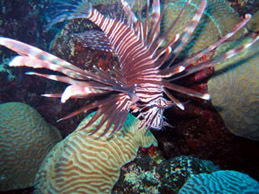 Diving in Bermuda with DIVE Bermuda was like diving in an aquarium or in an explorer's dream, and we cannot wait to return to this underwater paradise. Please read other articles on Bermuda in the Destinations, Hotels and Resorts, Restaurants, Chefs' Recipes, and Adventures sections.